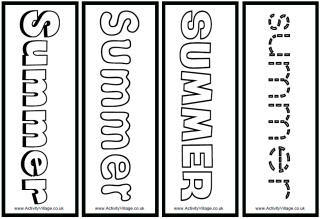 Our summer postcards have been designed to be quick to print and fun to colour and send! Just print onto ordinary printer paper, cut out and fold in half, gluing back to back. The kids can then colour in the front, write on the back and post the cards. Use them as "real" postcards or as a fun imaginative (and useful) writing activity in the classroom. Are you planning a caravan trip with the kids? Why not print out this colouring postcard so that they can send a special message to friends or family, with some of their best colouring included? Let the kids tell friends and family about a wonderful family picnic with the help of this fun colouring postcard. Just colour in the picture, cut around the edges, fold in half and glue. Then you are ready to write a message and stamp the postcard ready for sending!